Accidental injuries in and around the home are one of the leading causes of serious harm and death in young children in the UK. However, most of these injuries are preventable. Each year, it’s estimated that around 2 million children under the age of 15 are taken to accident and emergency (A&E) after being injured in or around the home. Around half a million of these children are younger than five. More information on preventing children from accidents at home can be found on the NHS Choices website, The Royal Society for the Prevention of Accidents website and also the Child Accident Prevention Trust (CAPT) website. Children’s Burns Trust (CBT) website. Every week children are injured due to ill-fitting child car seats. It is vital that parents ensure that children are securely fitted into child seats or seat belts on every journey. 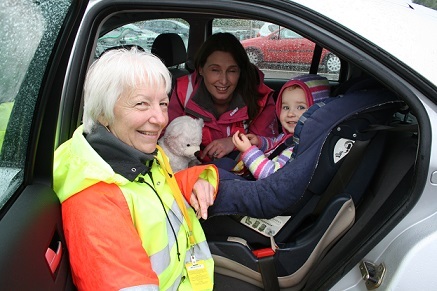 Our road safety team, in partnership with Avon and Somerset Police, hold free child car seat checks during the summer. Come along to make sure that your car seat is fitted correctly. It’s likely that young children will fall over and get knocks and bruises while learning to walk, but serious injuries can be avoided. Toddlers quickly learn how to climb and explore and it’s very easy for them to fall off a piece of furniture or down stairs. Falls usually happen at home or in the garden and there are lots of things you can do to reduce the risk to your child from falling. Sudden infant death syndrome (SIDS) – sometimes known as ‘cot death’ – is the sudden, unexpected and unexplained death of an apparently healthy baby. In the UK, over 200 babies die suddenly and unexpectedly every year. This statistic may sound alarming, but SIDS is rare and the risk of your baby dying from it is low. It is possible, however, to greatly lower the chances of it happening by following this simple sleep guidance. This advice is based on strong scientific evidence. You should try to follow the advice for all sleep periods where possible, not just at night. South Gloucestershire Council offer cycle training for young people. THINK! Education includes a wealth of road safety information and resources for pupils, teachers and parents. Babies and young children don’t have the control that adults have over their bodies. They can wriggle and squirm but it is harder for them to move out of a dangerous situation. The below websites give information on how to prevent suffocation and strangulation from happening. Young children can be fascinated by water, and swimming is great for a child’s health and fitness. The below websites give some tips to make sure that their time in the water is fun and safe. Most poisoning injuries involve medicines, household products and cosmetics. In South Gloucestershire we have six main children’s centres where friendly teams of highly skilled workers can offer support, assistance and advice to parents and carers of pre-school children (aged 0-5). More information can be found on the South Gloucestershire Council website.